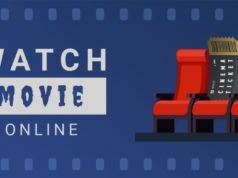 Just like many services for free movies and TV shows, there are a countless number of websites that let you stream free sports and your favorite gaming events. While some of these sites don’t charge a penny, others simply need the login of your TV or internet service provider for penniless access. 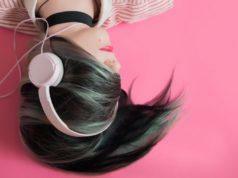 Note: Services like ESPN and NBC are mainly available in the US; Hotstar and Sony Liv provide great content to Indian audiences; Red Bull TV and DAZN have a wider reach. So, you can also use a VPN service to unblock restrictions and watch whatever you like. If you are interested in watching sports from the comfort of your living room or office, you must know how to stream ESPN over the internet. It’s one of the most popular sports streaming sites that broadcast events in high-definition. 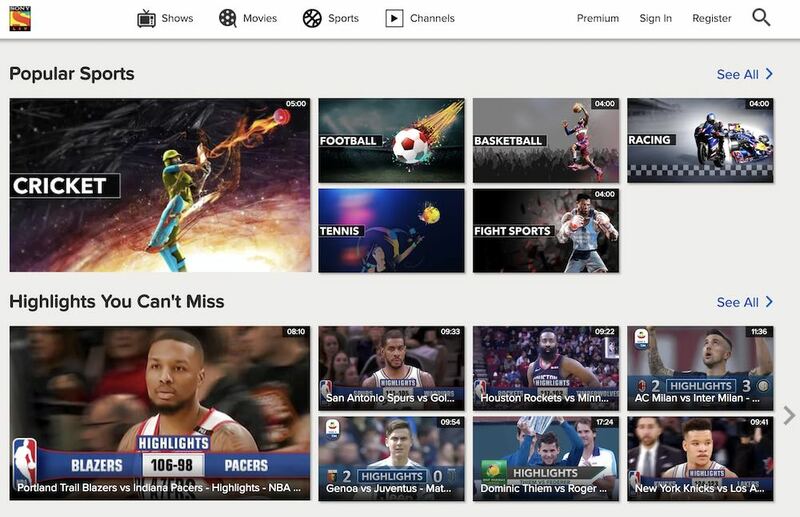 While trending videos, news, analysis, and highlights are free to all users, you can watch live sports matches if you have a connection of participating TV or internet providers. The list of participating services includes Cox, Hulu, Sling, Verizon, Xfinity, Directv, etc. All of these services are pretty common in the U.S., so you shouldn’t be facing any issues. Just sign in using those credentials to enjoy free live sports streaming. ESPN and a few sites mentioned ahead deliver content mainly to the American and European countries. But what if you belong to India and you’re a fan of Cricket and other sports that are popular in the subcontinent? In that case, you need to look for other legal sports streaming sites like Hoststar. 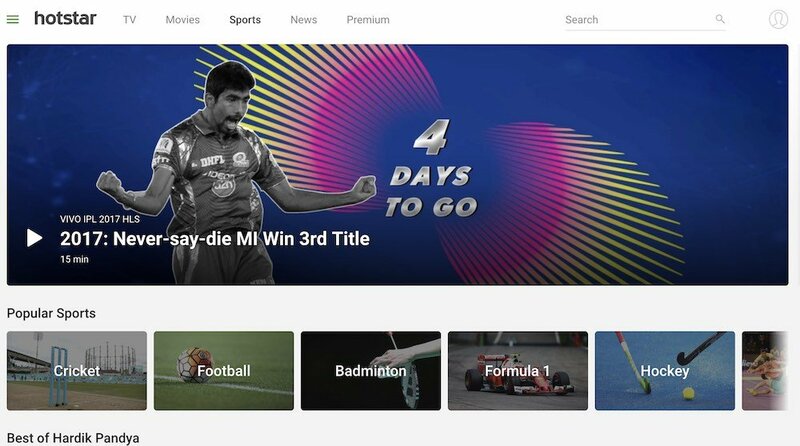 While many people visit Hotstar’s website for free movies and TV shows, it’s widely popular in India for watching sports like Cricket, Hockey, Kabaddi, Football, etc. This website is pretty well-designed, with all the major sports and tournaments clearly lined up in rows. Most sports streaming content on the site is free, but there is premium content as well. To access that, Hotstar also provides a sports-only package that’s dirt cheap. If you’re living outside India and unable to access the site’s free content, you can always use a VPN or proxy to unblock the restrictions. Red Bull TV is the most interesting and different entry on this list. This global and free of charge sports streaming site is home to different adventure sports, live sports programming, and some lifestyle content as well. 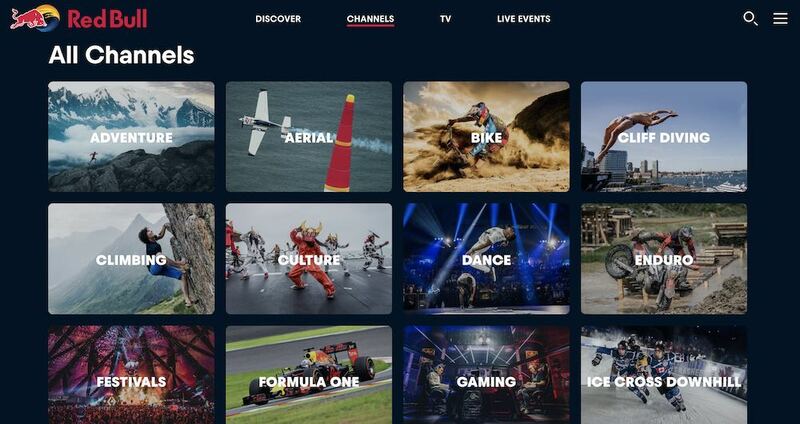 The service also keeps bringing original sports programming like Sky Trippers, URBEX, Sheckler, Who is J.O.B., UCI Mountain Bike World Cup, etc. 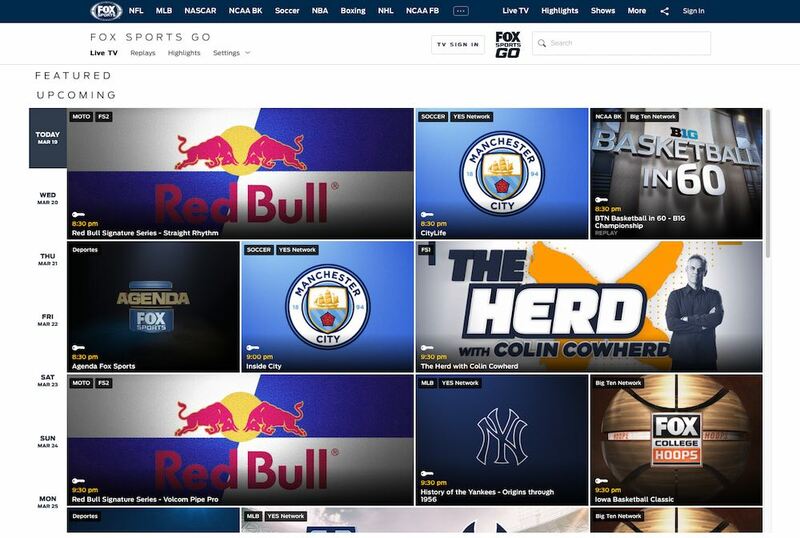 Another differentiating feature of Red Bull’s sports website is the listing of Athletes according to their country and sports. It lets one select his/her favorite sportsperson and learn more. Just like ESPN, Fox Sports website can also act as a great means to cut the cord and enjoy free sports online. The website is well designed and shows you the scores from featured matches at the top. There are online match schedules, highlights, and interviews that are completely free to access. Coming to the free and legal sports streaming part, it’s pretty similar to what you need to do to watch free matches on ESPN. If you have data and TV services from providers like Xfinity, Verizon, Cox, AT&T U-verse, Directv, Spectrum, Frontier, etc., you can use your login to access free sports online. Sony Liv is another website that you can use on your web browser to stream live sports. It also has a dedicated page to display the schedule of important upcoming matches. Talking about the sports, each of them has a dedicated page, featuring highlights, talk shows, news, fixtures, etc. If your internet connection is slow, then Sony Liv also lets you change the quality of streaming. Regarding the access, this sports streaming site is completely free. There’s an option to pay for the premium content but that only adds entertainment and movie channels. So, if you’re simply interested in sports, this option is useless for you. 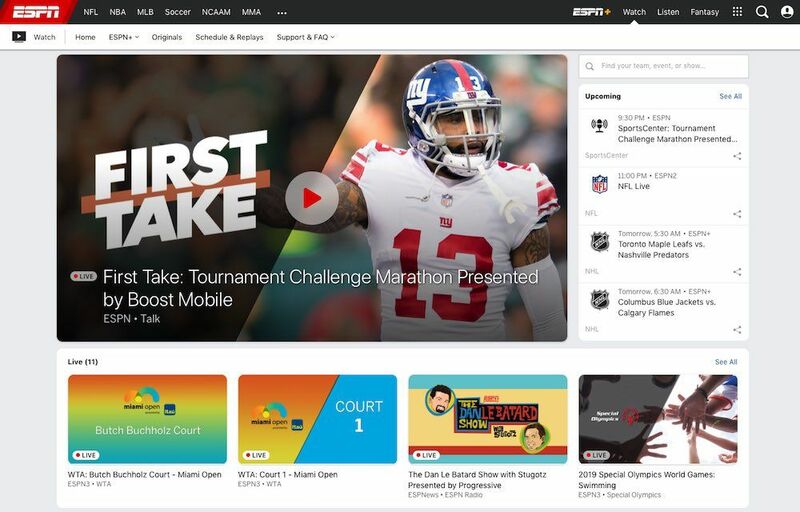 DAZN is a live and on-demand sports streaming service that’s like a breath of fresh air. First launched in Austria, Germany, and Japan in 2016, the service has now expanded to Canada, USA, Brazil, and other countries. It offers a first-month-free option that’s perfect for people who aren’t ready for a long-term commitment. 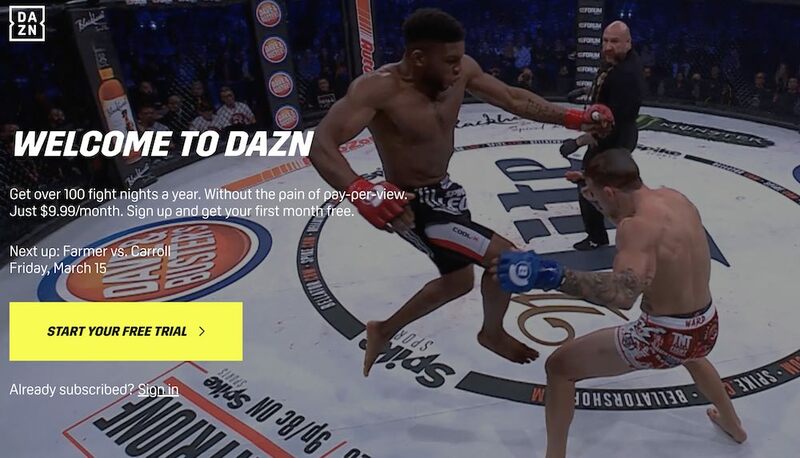 When DAZN was initially launched, it was solely focused on fighting sports. With time, the site has been able to expand its portfolio. Currently, this online and legal sports site offers 8,000+ sports events a year and a subscription gives you access to 100 fight nights a year. Just like ESPN and Fox Sports, NBC Sports is another streaming provider of live sports events popular in the US. Along with videos, the website also hosts news articles, schedules, and other useful features. At the top, the site displays the scores of different live matches. 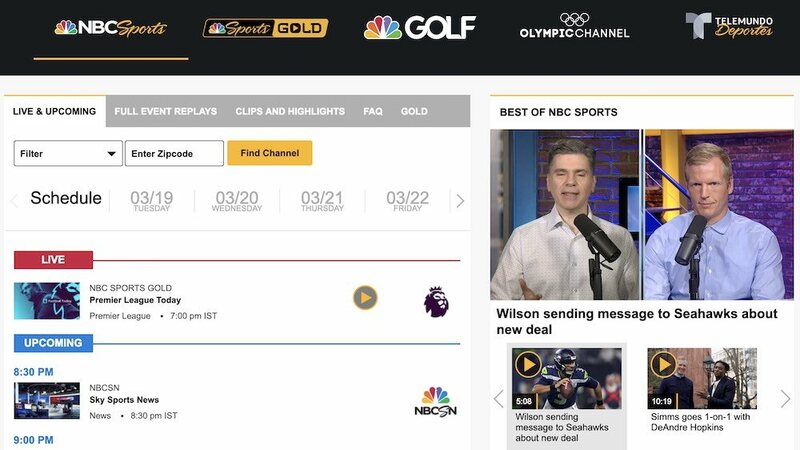 Moving on to the free sports streaming using NBC Sports, you can do so by logging in via your cable TV provider credentials. Some of the supported TV services letting you watch free content as Xfinity, Directv, Dish, Verizon, Spectrum, Cox, Cable One, Armstrong, etc. 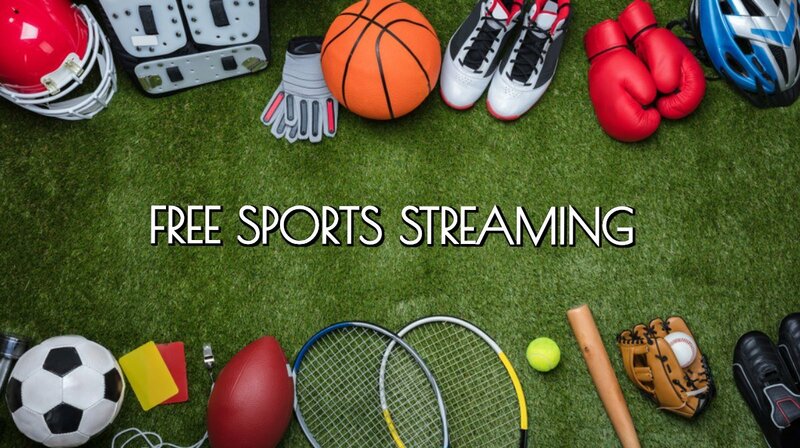 These were some of the best options for free sports streaming out there. If you search for websites to watch sports on Google, you’ll end up with lists of resources delivering illegal streams. While that’s entirely unethical, those websites can also be a source of intrusive advertisements and malware. So, choose wisely and visit the above-mentioned sources for a safe streaming experience.